basket for drawing his irreconcilably bad book. 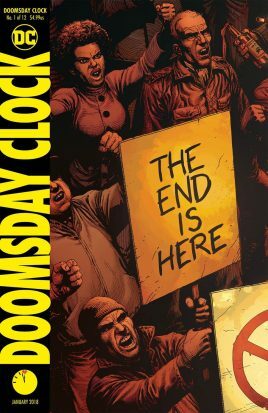 In a vacuum, the premise of Doomsday Clock isn’t great. Dr. Manhattan has been mucking about in the DC Universe and I guess Superman is going to do something about it. Okay, not a great start. In practice it’s even worse. dream” as a brick shatters a pane of glass might have been clever once, but that day is long since passed. The Russians talk about having bought and sold the government. A news anchor talks about the lack of a presidential response along side B roll of a fall golf bag. Okay, I get it. Watchmen was an allegory to repudiate Reaganism. But what is Doomsday Clock about? Anything? It feels like “ripped from the headlines” only for its own sake without the intelligence of Alan Moore. about just making his own pocket universe. good that other thing is. Its clear that Johns loves Watchmen but unclear that he really read it or that it resonated with him on any deeper level than its most clearly denoted thoughts and preoccupations. Often, its not even particularly good at that. One of the most notable and memorable features of Moore’s Watchmen is its dogmatic adherence to the nine panel layout. Doomsday Clock has this too! Except when it doesn’t. There’s a strange page late in the book that moves to a twelve panel format for no discernible reason. There’s no frenetic action or dialogue that couldn’t really be shifted. The page exists simply because it exists in this format. This page is part of a dream sequence and it would have been notable if the remaining pages of the dream sequence were actually laid out the same way. Except they’re not. You tell me why. Perhaps the only interesting thing is the Mime, a serial killer who is a mime. Everything around the Mime has a little more flair and a little more grace than the entire rest of the book. His panels are almost lovely but not worth reading the book for. With the except of my layout gripes Frank and Anderson do a great job of polishing a turd. The lines and colors don’t aim to be evocative of the original but instead simply look good. I think they look good, very good. But they’re unable to dig out what is an abysmal effort in the writing. 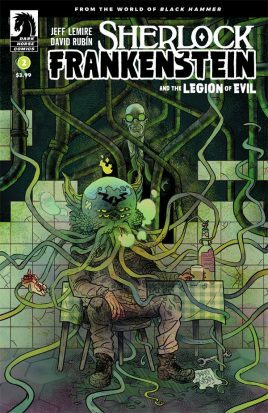 From the pages of Black Hammer comes the only spin-off I approve of! If my opinion means anything to anyone, thank you. 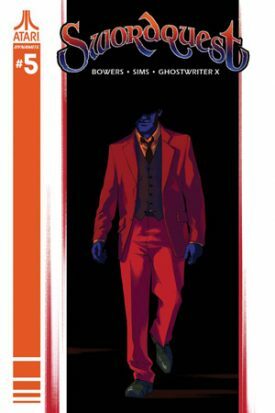 Intrepid journalist Lucy Weber continues on her mission to find out what happened to her father, the missing (and presumed dead) superhero Black Hammer. Lucy is having trouble making sense of anything she’s found so far about the mysterious Sherlock Frankenstein, so in her dedication to both family and career, she’s following any lead she can. And that brings us to Cthu-Lou. Lou Kaminski is a former plumber who seemed nice enough, but maybe wasn’t so respected in his day job. His wife doesn’t seem to think much of him either. Lou may have a drinking problem and may hear voices, but he does what he can to get by. I didn’t know that a super villain’s home life could be so dysfunctional, but really, it makes sense. It’s especially noticeable in issue #2 how important the sound effects-as-words are to setting tone and building tension. Artist David Rubin brings to life haunting, creaking doors and visceral, head twisting sounds (schorp!) and these sounds-as-words are as much a part of the scenery as the buildings of Spiral City. I initially read issue #2 digitally (haven’t had the chance to get to my local shop to grab the physical issue yet) and I can say, in not just my own Luddite way, that digital reading doesn’t do justice to Rubin’s art, particularly his judicious use of two page spreads. Issue #3 of Sherlock Frankenstein promises an encounter with Metal Minotaur. After spending time with the relatively docile Cthu-Lou, I fear what Lucy will be up against next. This was a fun ride. While there seems to be so much more that could be unpacked story-wise, Swordquest #5 delivers a satisfying conclusion. There are a number of things that could have happened that didn’t, especially once legit magic started popping up in this series. Not to spoil to much but I’m glad that the magic didn’t undo certain things. There are characters that should not have worked or have been taken seriously, but somehow it all did. I have some complaints about some of the twists and turns taken by this series, but overall I really enjoyed this take on a comic book adaptation of the weird Atari game Swordquest. Before delving into the written handiwork of Chad Bowers and Chris Sims I would like to give credit to artist Ghostwriter X. His work for the most part has added a wonderful Atari and cartoon-reality layer that linked a unique story to the source material. Ghostwriter X added an additional layer of fun to what has been a surprising balancing act of drama and comedy, never fully removing us from that drama. I would like to see him team up with Bowers and Sims in the future. As for Bowers and Sims, their writing on this series was solid, with maybe some slips in the last couple of issues wrapping things up. I feel like there was more story that could have been told, but at the same time I applaud them for not spelling too much out. I think this issue sort of explains the lack of backstory to what Peter’s been up to since high school for instance, or we’re simply led to believe that in the last 15 years he’s led an uneventful life. I also would have liked more of the video game enhancements that were amusingly inserted in the first few issues. At the end of the day these omissions were done tastefully though. This was a focused quest either way, and while I’m sure the three primary earthbound characters all have interesting stories to tell we the audience just want to know the story as it pertains to Peter’s quest to steal the sword, and will take Hemingway’s Iceberg Theory to fill out the background of our world and the other world known as Atara. This is a tale with many layers of Rulero, his friends and enemy Konjuro, and there’s a good chance a number of people will care about such ridiculously-named characters, and a place named Atara. That is a victory unto itself. For anyone looking for a comic series that’s a little different, check this out. I also recommend this series to anyone who loves video games, especially those that came out on the Atari system. 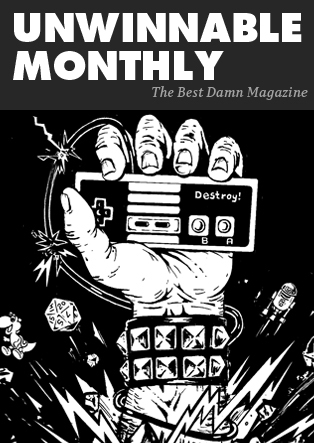 It’s an interesting slice of life about the children of the primitive richness of 80s video games being offered the chance to escape the realities of adulthood that they’ve endured for years. What if you had the opportunity to bend that reality and become immersed in that world of your escapist past, would you take it?